It was all a strangely exhilarating experience. The snow shook up our drowsy lives and suddenly there was something to new to think about and wonder at and plan for/around. Oh and the beauty of it! All that pure untrodden whiteness while it still fell; that day off from work made it seem like we were on vacation and it felt as if we had come to a different land without having to travel. It was also an oddly peaceful time, as if someone else had pressed the pause button on all our daily activity without consulting us and we had leave to just sit and stare at the snow without getting restless. A time for zen. A time for soup. 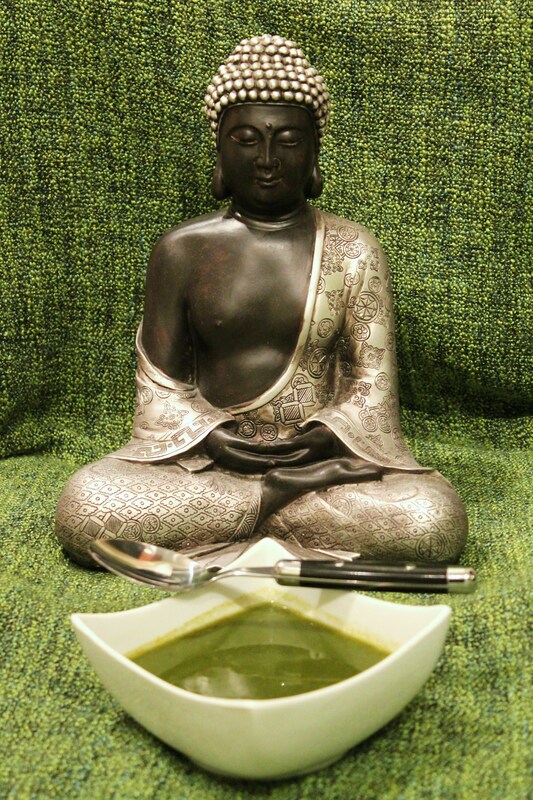 And if there is a soup for zen, it is this calm green spinach soup. I had been searching for a good spinach soup recipe for a while, and destiny herself must’ve heard me, because I visited my aunt and there it was, the best spinach soup I had tasted in a long long time. It has not a drop of oil, and while it does have a bit of cream to be added in the end, you can replace that with milk if you want. It is also, by far the easiest thing I have ever made and I have wasted absolutely no time in sharing it with you. Make it today! Bring the water to a rolling boil in a deep saucepan. Add salt to it. Blanch the spinach. Keep aside. In the same water, add the onion, tomatoes (whole), garlic and ginger, lower the heat and simmer for 15 mins, or more if needed, until vegetables are tender. Wait for it to cool down a bit and then puree the boiled vegetables and the blanched spinach in a blender. Transfer the puree back in the saucepan, add a little bit of water if its too thick to bring to desired consistency and season well with freshly cracked pepper and salt if needed. Simmer again untill heated through. Stir in the cream and remove from heat. Serve piping hot. To blanch, bring water to a boil, drop the spinach in it and cook for a couple of minutes. Remove and rinse in cold water to cool down. If you want to be really quick about it, and don’t particularly care about the colour of your soup, stick everything into a pressure cooker and cook until the cooker whistles twice. You could even blanch the spinach separately and put the rest of the vegetables into a pressure cooker. I would still use the water that the spinach was cooked in, though. You could put a dab of homemade butter instead of the cream. Or milk. Just a little something is necessary to add some creaminess, so don’t omit it entirely.